This post is by expedition members Hannah Barkley and Kathryn Rose. 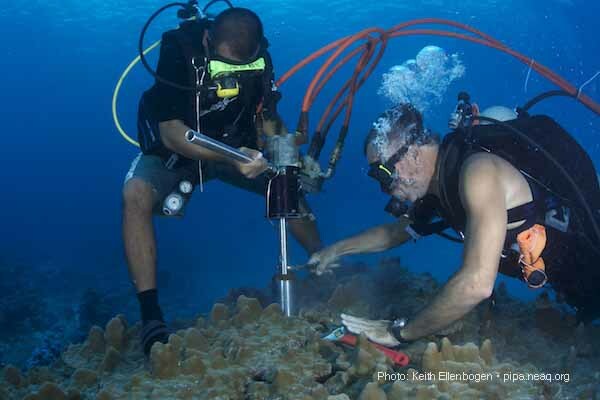 Our lab studies the effect of climate change on coral reefs. The major threats to coral reefs that are associated with a changing climate are twofold. The first is the warming of the oceans. The increase in carbon dioxide in the atmosphere is warming the earth through the greenhouse effect. This increase in temperature also occurs in the oceans, and we have observed measurable warming of the oceans in the past few decades. Higher temperatures are devastating to corals because they can lead to the breakdown of the delicate symbiosis between the coral animal and its photosynthetic algae that allows corals to grow. When corals are stressed at higher temperatures, they expel their algae. Because the algae give the coral their color (the coral tissue itself is clear), the loss of algae causes the underlying white skeleton to become visible. Thus, this process is termed coral bleaching. Coral bleaching very often leads to the death of corals, and the cascading effects of coral mortality that occur through tropical ecosystems can ultimately devastate entire reef systems. Kanton Island in the Phoenix Islands during the 2009 PIPA Expedition (Photo: Brian Skerry). The second major threat to coral reefs is the acidification of surface oceans. In addition to warming the ocean, the increase of carbon dioxide and other greenhouse gases in the atmosphere leads to the increased dissolution of carbon dioxide in the oceans. Due to the complex chemistry of ocean water, this ultimately leads to a decrease in pH. This process, called ocean acidification, is a threat to corals because the drop in pH makes it difficult for corals to build their skeletons. In fact, corals are usually unable to produce any skeleton at all in extremely acidified conditions. As a result, ocean acidification threatens the ability of corals to build the structures that support a multitude of other reef organisms in the future. These threats to coral reefs have intensified in recent years, especially as temperatures have increased. There have been a number of severe coral bleaching events in the past few years. Most notably, scientists observed up to 100% coral mortality worldwide in 1998 and again in 2010 when ocean temperatures became very warm in associated with strong El Nino events. 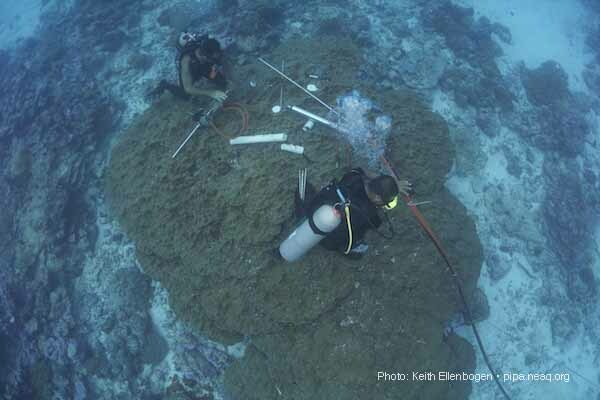 Expedition team members Pat and Jay prepare to take a core sample of a coral. We also know that many of the corals in the Phoenix Islands bleached in 2002, and that many of the reefs in this island system experienced considerable coral mortality during this time. Ten years later, we are interested in examining how well the corals are recovering from this (and other) stress. To do so, we are using information that has been stored within the coral skeleton. As corals grow, they lay down a calcium carbonate skeleton in alternating bands of high and low density. Like the rings of trees, these bands are an annual record of coral growth, as the distance between bands signifies how much a coral grew in a particular year. We can use this information to determine how fast a coral was growing each year, whether the coral was stressed during a particular period of time, and whether the growth rate of the coral is increasing or decreasing over time. Because the Phoenix Islands are largely uninhabited, the historical growth patterns preserved in coral skeletons are perhaps the only record we have for how the corals around these islands have been growing for the past few decades. Expedition team members Pat and Jay using the pneumatic drill to collect a core sample. As you might imagine, obtaining these skeletal records is no easy feat. 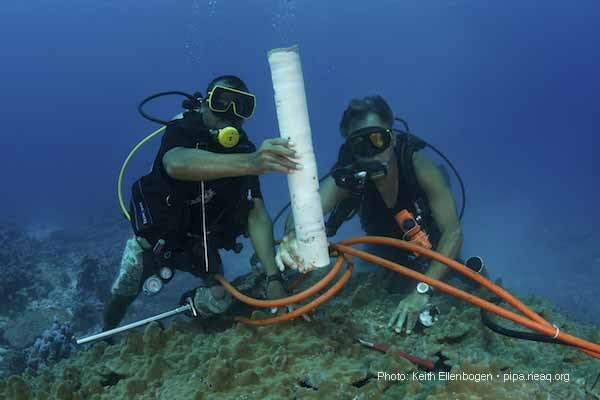 We access the coral growth record by collecting cores from the coral skeleton. Our team uses two types of drills to obtain cores: pneumatic and hydraulic drills. The pneumatic (powered by air) drills are smaller, hand-held drills can collect cores 3 cm in diameter and up to 45 cm long. The hydraulic (powered by vegetable oil) drill is considerably larger, requiring two people to operate and producing cores that are 8 cm in diameter up to 6 m long. Expedition team members Pat and Jay hold a carefully collected coral core sample. Unfortunately, the growth bands are not visible to the naked eye, so scientists have to be creative to see them! Our lab has turned to medical technology to visualize the coral banding pattern. Upon our return to our lab at Woods Hole Oceanographic Institution, we will scan the cores we have collected in a CT-scanner – the same way doctors examine their patients! These scans allow us to visualize the bands in the cores, and we can use these images of the cores and their bands to calculate coral growth rates. The particular coral species that we are studying grows about 1-2cm per year, and so a 3m long record could trace coral growth for up to the past 300 years! We can examine the growth record of multiple corals to understand the general trends in coral growth on these reefs.